Map of the South Shetland Islands. 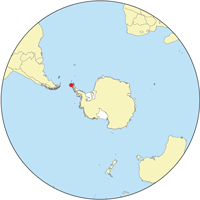 The South Shetland Islands are a group of islands, lying about 75 miles north of the Antarctic Peninsula, with a total area of 1,424 square miles. The islands form part of the United Kingdom's claims in Antartica, the British Antarctic Territory. However the islands are uninhabited and by the Antarctic Treaty of 1959, all claims to sovereignty of the Islands are suspended, though treaty signatories (including Britain) are free to use the islands for non-military purposes. The United Kingdom has claimed the Islands since 1908. Also Chile has claimed them since 1940 and Argentina since 1943. Several countries maintain research stations on the Islands. Most of them are situated on King George Island, benefitting from the airfield of the Chilean base Eduardo Frei. ↑ "South Shetland Islands". North Dakota State University. http://www.ndsu.edu/subantarctic/south_shetland_islands.htm. Retrieved 2009-08-21. This page was last modified on 1 June 2012, at 16:59.